Greece's banks are still mired in a crisis despite the country's latest debt deal with Europe. A Greek official told CNN that the country's banks, which have already been closed for two weeks, won't open until Thursday. Daily withdrawal limits are also still in place. It follows a decision by the European Central Bank on Monday not to increase its support to Greece's cash-starved banks. "The European Central Bank keeps the emergency liquidity assistance to Greece unchanged," a spokeswoman told CNN. A new bailout agreement with international lenders could see Greece's financial fortunes begin to improve, but the desperately needed funds it promises are still some ways off. Greek banks can't reopen without more funding from the ECB, and economists believe the closures could stretch on for days, if not weeks. Fearing economic collapse, locals have drained tens of billions of euros from their accounts in recent months, and Greek banks are fast running out of cash. European leaders struck a deal Monday for a $96 billion bailout for Greece in exchange for deep economic reforms. The plan includes 25 billion euros ($26.7 billion) to recapitalize the banks. 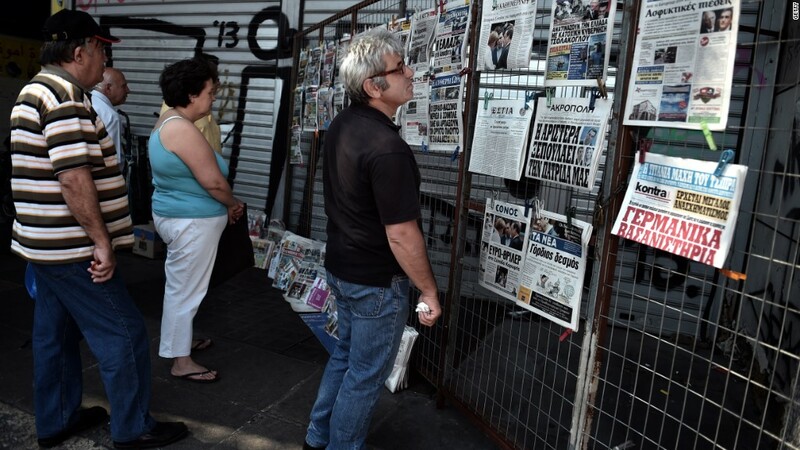 The Greek parliament must approve the deal on Wednesday. If approved, the ECB could slowly turn on the tap to support Greece's banks. But Oxford Economics chief economist James Nixon said even if lawmakers give the green light, any increase in emergency funding from the ECB would be modest. "Capital controls of some form or another are almost certainly here to stay for several more months and probably considerably longer," Nixon said. That means more pain for those living through the crisis. Nervousness has driven many Greeks to go to ATMs every day to take out as much money as they're allowed. Pensioners relying on regular government payments are among those having the toughest time. Certain banks have been allowed to remain open so retirees can collect their checks. But many of these people have to wait in long lines and have been restricted to 120 euros ($133) per week. - CNN's Chris Liakos, Zahra Ullah and Ivana Kottasova contributed to this report.